This past weekend, I thought it would be fun to pack a picnic and take my kids to a nearby pond. As an added bonus, this pond I had in mind has a ton of ducks and geese, and I knew they would love feeding them once we were done with our lunch. 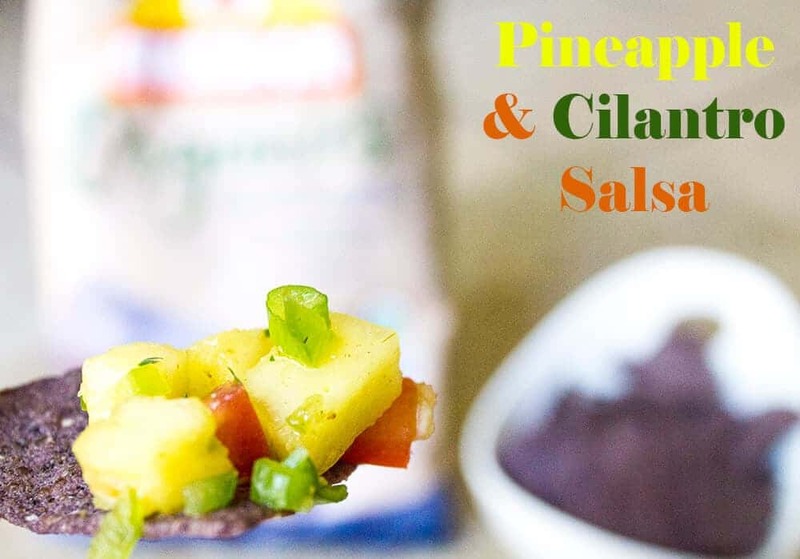 I also thought it would be a great excuse to make one of my newest favorite dips – my easy pineapple salsa recipe – to go with a bag of Mission Organics® Tortilla Chips I had picked up from Target. 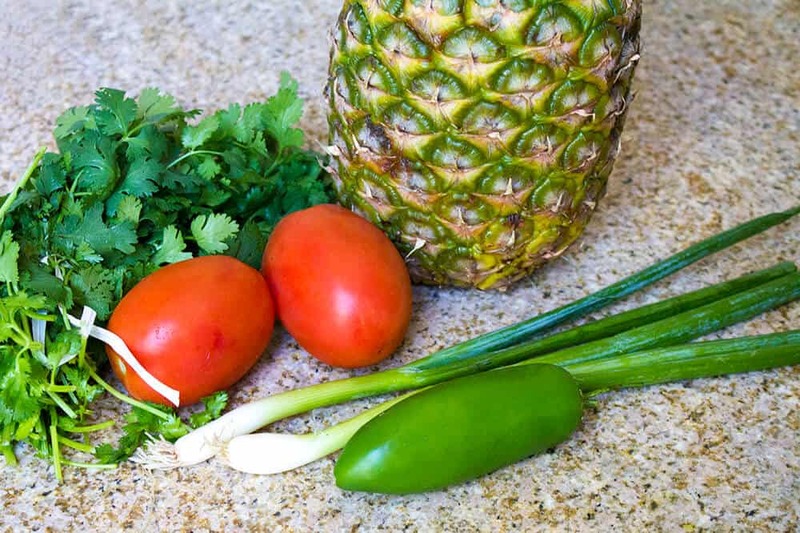 I love this Fresh Pineapple and Cilantro Salsa Recipe because it is made with colorful produce and it packs a ton of well-balanced flavor. This dip is a favorite at summer get-togethers, but it’s also easy enough to put together for a family picnic, if you have 10 minutes to spare. You start with a fresh pineapple, removing the crown and stem. Cut the pineapple in quarters, then slice off the core. The final step is to cut away the skin, which will leave you juicy, delicious pineapple. The whole process may sound difficult, if you’ve never cut up a pineapple before, but it only takes 2 or 3 minutes. Once you have your fresh pineapple, cut it into small tidbid-sized pieces, and add it to a bowl. Next comes 2 Roma tomatoes, which you’ll quarter, then scoop the seeds out, and dice into cubes the same size as the pineapple. Grab a jalapeno, remove the stem, and cut in half. Remove the seeds, and dice into small pieces. Dice a couple of green onions mince a garlic clove and chop up some fresh cilantro. These aromatic additions join the rest of the produce in the bowl. The final step is to season the fresh pineapple salsa with ground cumin, coriander (optional), and salt and stir the amazing flavors together. This fresh pineapple salsa gets better as it marinates, so you can definitely make this a day ahead of time! When I saw Mission Organics Tortilla Chips at Target, I immediately put them into the cart, and couldn’t wait to pair them with my Fresh Pineapple and Cilantro Salsa Recipe! 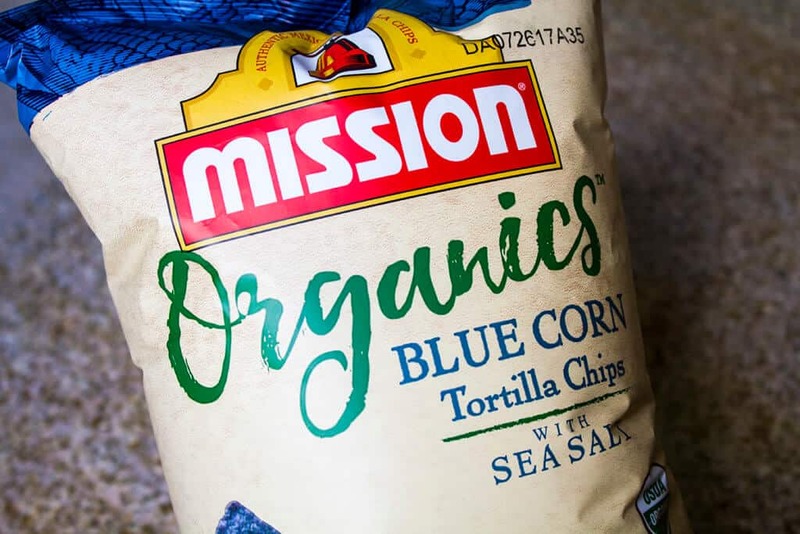 Mission Organics® Tortilla Chips are USDA organic certified and non-GMO project verified. You won’t find any artificial colors or preservatives in these chips! They’re also incredibly tasty, having the perfect crispness and saltiness to balance out the natural corn flavor. I can honestly say they’re the best tortilla chips I have bought. Their Yellow Corn and Multigrain chips are new to the market, and you can use their store locator to find an organic bag near you! Remove the crown and stem from the pineapple, cut the pineapple in quarters, and cut away the core. Remove the skin, then dice fresh pineapple into tidbit sizes. Quarter tomatoes and scoop out seeds. Cut tomatoes into cubes the same size as the pineapples. Remove the stem from the jalapeno, and remove the seeds. Cut into small pieces. Dice green onions, mince garlic, and quickly chop cilantro leaves. 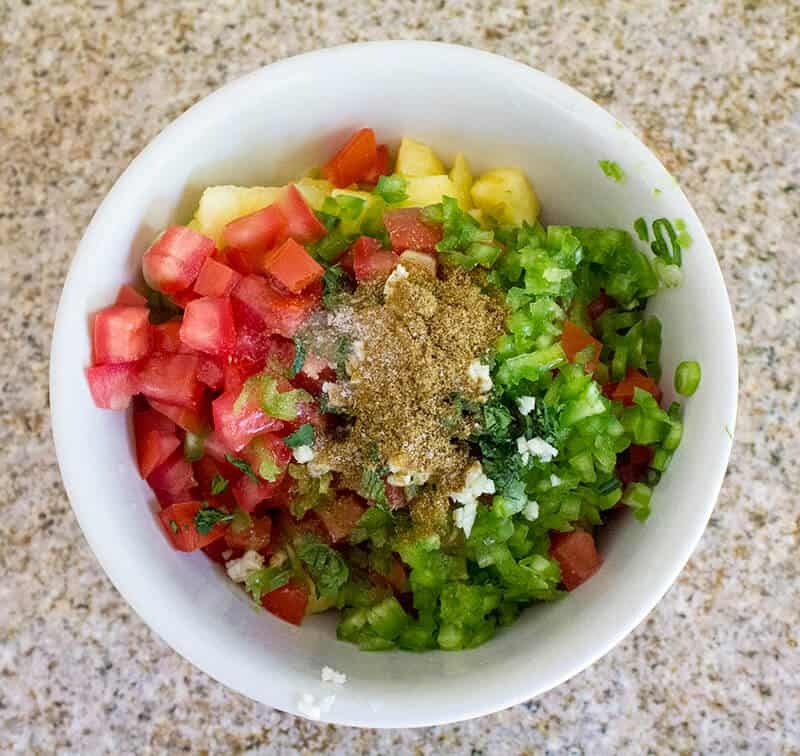 Add diced pineapples, tomatoes, jalapenos, green onions, garlic and cilantro leaves to a bowl, and season with olive oil, cumin, coriander and salt. Stir to mix, and enjoy! 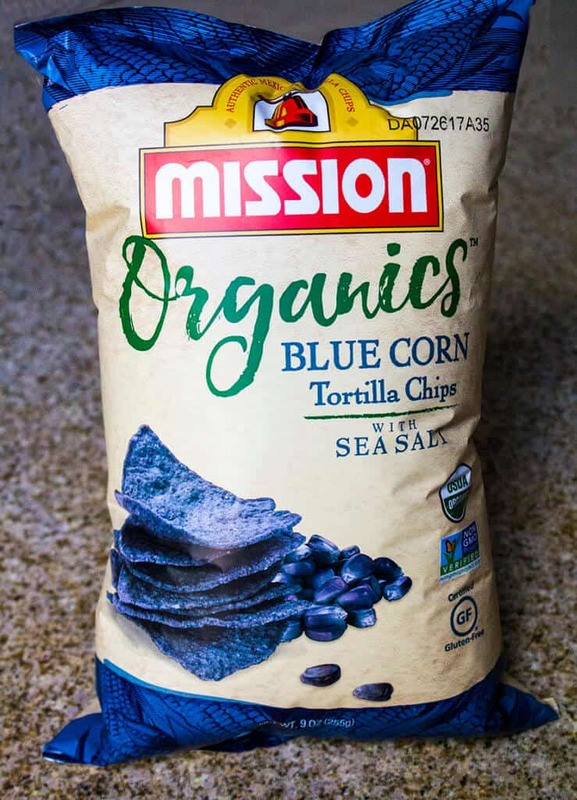 Be sure to check out Mission Organics Tortilla Chips website for more delicious recipes to try this summer! Pineapple is not my favorite…but this looks so good! Definitely going to try this out sometime! Thanks for the great tip! I love a tangy taste of pineapple as dips for salsa chips. I’m going to try making this. I know my hubby is going to love it. We love pineapple and putting it in salsa sounds like a win win with those chips. Will have to make it this weekend. I was looking for something to serve at my next barbecue. This looks delicious and refreshing. I love me some fruit salsa – it really takes it to a new level. That salsa recipe looks like something I think we’d enjoy. I love anything with pineapple on it. I’ll have to pick up some of those chips and see if I can make your recipe. I love making this type of salsa!! Sometimes we do mango too! I love anything that comes with pineapple, even the pizza! Thanks for sharing another recipe 🙂 Gonna try this weekend. I grew up with a pineapple field one street away from my home. (really!) I love anything and everything with pineapple (except pizza, blech). Can’t wait to give your salsa recipe a try. I have never tried pineapple in salsa before. My family and I love the juicy fruit though! 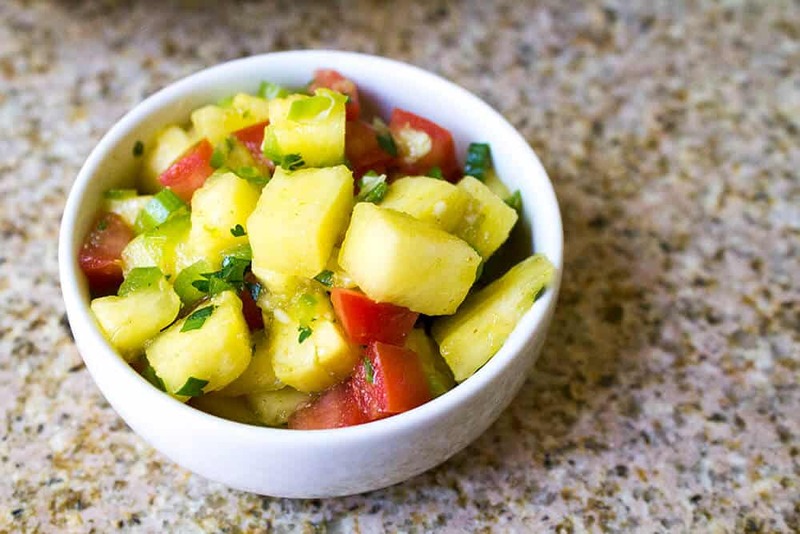 Oh my this Fresh Pineapple and Cilantro Salsa looks so delicious and easy to make. I will have to get the ingredients I need to make some this weekend. I am sure it will be a hit at the BBQ.